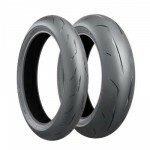 The Bridgestone Battlax RS11 is an Original Equipment Racing Street tyre for the bikes listed below. 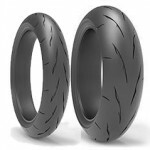 Modern MotoGP technologies in a high performance street and track day tyre. Unique 3D tread groove walls improve block stiffness for better handling response, and improved acceleration out of the corners. New compound delivers a more consistent performance, even at higher temperatures.